On 5 February, ETF General Secretary Eduardo Chagas and our Senior Operations Manager Josef Maurer were in Poland to meet with Polish affiliate unions representing all transport sectors. In an impressive proof of their solidarity and commitment , every Polish affiliate union was present. It is vital for ETF’s work that our leadership understands the everyday reality facing transport workers across Europe. So the main focus of the meeting was an extensive discussion about the difficult situation for transport workers in Poland. Our affiliates told us about truck drivers without access to basic facilities like toilets or showers, the liberalisation and fragmentation of the railways, the “ryanairisation” of aviation which is damaging the whole sector, and issues in the education and training of seafarers. This first day in Poland was also a great occasion to present ETF’s new training and capacity building project, which will help trade unions develop the knowledge and skills to shape the future of transport in Central and Eastern Europe. 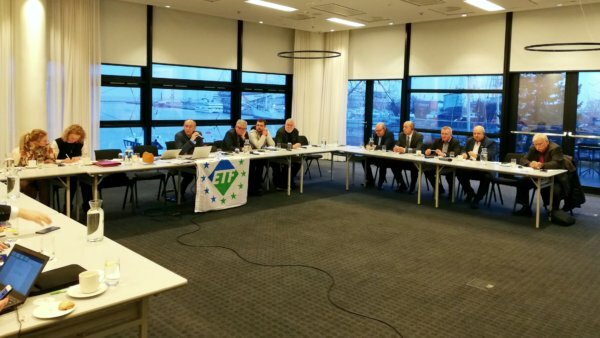 The ETF’s ongoing Fair Transport campaign was also discussed, and Polish affiliates made a commitment to join action week in March 2019. On 6 February, on the invitation of our fellow European Trade Union Federation (ETUF) UNI Europa, we participated in the advisory board of their Central European Organising Centre (COZZ), which focuses on organising in Czechia, Hungary, Poland and Slovakia. We were joined by other ETUFs: EFFAT, EPSU and IndustriAll. As good examples of regional campaigns in transport, we presented the international support for successful struggles by Turkish ITF/ETF affiliate Tümtis against UPS and DHL Express.